BRUSSELS — Here in the political heart of Europe, the U.K. is about to face its most dramatic crossroads in a Brexit process that has been thwarted by stubbornness and indecision. And the country will have little say over its own fate. On Wednesday night, 27 prime ministers and presidents from across the European Union will gather for a high-stakes summit. They will have two broad options — both have seismic consequences for the U.K. and beyond. The leaders could reluctantly offer another extension to when Brexit will happen, meaning Britain would not leave the E.U. for at least another few weeks and perhaps even an entire year. Brexit was initially scheduled for March 29. If they refuse to offer British Prime Minister Theresa May a delay, her country will crash out of Europe without a dealon Friday, leaving the U.K. floundering without any international trade agreements. According to the government's own analysis and most experts, a "no-deal" Brexit would significantly shrink the country's economy, compromise security and raise prices, while supermarkets have warned of shortages of fresh produce. In preparation, the state-run National Health Service is stockpiling medicine and reportedly even body bags. It is the second delay requested by May. She has asked for more time because the plan she negotiated with the E.U. has on three occasions been unable to win enough support among U.K. lawmakers. It also has threatened to tear apart her ruling Conservative Party. If the British public are drowning in Brexit's inner psychological turmoil, the mood here in Brussels is one of total bewildermentand exasperation at their cousins across the English Channel. In the nearly three years since the British people voted to leave the E.U., their government has failed to agree on even the first baby steps toward unpicking the countless laws and regulations that bind it to Europe. Nevertheless, consensus seems to be building among the bloc's member states that they should, begrudgingly, agree to offer May her requested extension, according to four E.U. diplomats speaking on condition of anonymity because they were not authorized to speak to journalists. "I believe that no leader will want to take the risk of blocking the extension and then being blamed for a 'no-deal' Brexit," one of the diplomats told NBC News. Although a "no-deal" Brexit does have its supporters, most experts see it as a nightmare scenario. It might even provoke a return to violence on the Irish border. This boundary between Northern Ireland, which is part of the U.K., and the Irish Republic, which is a separate country and will remain in the E.U., was the focus of a 30-year armed conflict known as "The Troubles." The violence only calmed with a hard-won peace deal in 1998 that all but erased the line. There are widespread fears that a "no-deal" Brexit would bring a hard border that could well become a target for the type of sectarian violence not seen since then. So when European leaders are faced with the imperfect choice: offer the U.K. an extension or risk violence on the border of one of their allies, many believe that European loyalty will win out. "Ireland is the thing that worries other European members the most. It's just so sensitive," another E.U. diplomat said. An extension is far from a done deal though. Any decision will have to be reached unanimously, meaning it would take just one "no" from a club featuring a membership as varied as Hungary, Slovakia, Cyprus, and Malta. "For all the work that the advisers and sherpas do ahead of time, it is just the leaders in that room, and it can really come down to any one of them," according to one senior E.U. official, also speaking anonymously because of the delicate status of the negotiations. For all the previous speculation, what's decided in that room at the special summit of the European Council is the "only game in town," as European Commission spokesman Margaritis Schinas put it in a briefing last week. If any country is likely to consign the U.K. to the fate of no-deal, it's France. French President Emmanuel Macron has previously warned May that if she wants to avoid a "no-deal" Brexit it's up to her to win parliamentary support for her plan before Wednesday's summit. This is a towering challenge, not least because it's asking her to do something in a matter of days that she's repeatedly failed to achieve over many months. In a rare and extremely belated moment of bipartisanship, May reached out to Labour Party leader Jeremy Corbyn to try to find a solution that would end the parliamentary gridlock, but those talks have yet to yield any concrete results. 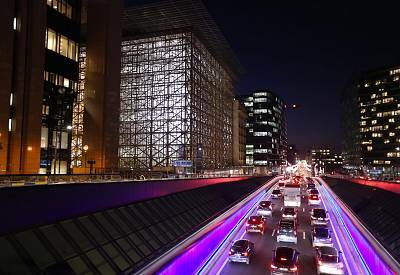 After days of shuttle-diplomacy around Europe, the prime minister is set to present her case to the bloc's leaders Wednesday, which will be held in the futuristic cube that is Brussels' Europa Building. But she won't be in the room when a final decision is made. For a country that voted to "take back control" in June 2016, its future is now in the hands of the very European leaders it wanted to divorce. "Will France press the nuclear button? That's for only Mr. Macron to decide," the senior E.U. official said. Murmurs of a possible French veto have put some nerves on edge. Irish Prime Minister Leo Varadkar told his national broadcaster this weekend that any country that vetoed the extension "wouldn't be forgiven." In a week that began with a sullen fog hanging over Brussels, the weather here has matched the political mood. Many Brits love to hate Brexit. In Brussels, most political officials plain hate it. Many people who work for the E.U. are deeply frustrated at being caught up in what they see as an unnecessary circus that arose from petty political bickering in London. It's now sapping time and energy from issues they see as more pressing. "The view from Brussels is that we are getting really rather tired of it. We have got other things to be getting on with," said Michael Emerson, a former ambassador to the European Commission who is now an associate senior research fellow at the Centre for European Policy Studies think tank. At this late stage, with the 11th hour having passed weeks ago, there are no pain-free options left in the process. Even if Britain is granted a delay this week, that route is rife with dizzying twists and contradictions. The great unresolved question among member states is how long any extension should be. Pro-Europe supporters will hope a long postponement will raise the chances of a second referendum or even canceling Brexit altogether. However, there is a major headache in the shape of looming European Parliament elections, which are being held across the continent from May 23 - 26. May has repeatedly rejected taking part in that election, but on Monday her government confirmed it had taken the first official steps to doing so, albeit insisting this was just a precaution. This is where things get messy fast. Some of Britain's European Parliament seats have been reallocated to other countries. If the U.K. remains in the bloc even temporarily, these nations would have to give back their new seats to a member that, officially at least, doesn't really want them. The British public would then face the surreal prospect of being asked to vote for representatives in a bloc they voted to leave 33 months ago. 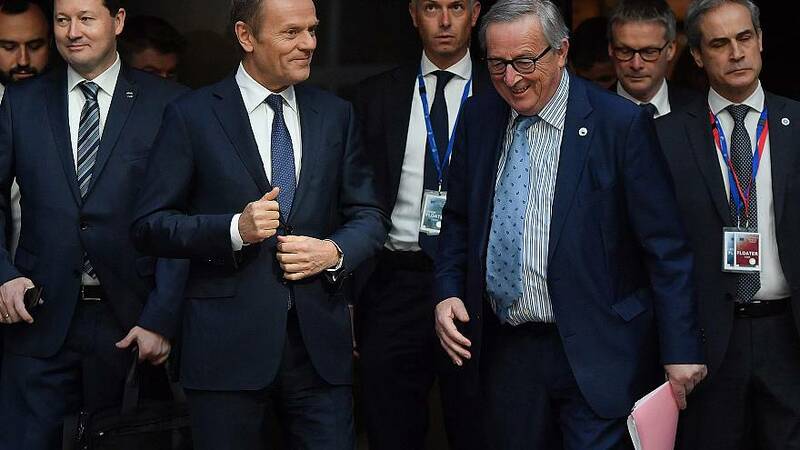 May and European Council President Donald Tusk have raised the possibility of a "flextension" — canceling the delay immediately if a deal is thrashed out — but how this would work if the election campaign is already underway remains unclear. A longer extension could be even more disorderly. Many in Brussels are deeply troubled by the idea of the U.K. remaining as a temporary yet powerful and potentially disruptive member. Meanwhile, Brits who work and live with their families in Brussels have been left in limbo. "I plan to carry on here until we can't carry on any longer," said Seb Dance, a European lawmaker for the opposition Labour Party who supports remaining in Europe. "I think when I leave, it will be a last-minute dash in the car back to London." Alexander Smith reported from Brussels and Rachel Elbaum from London.